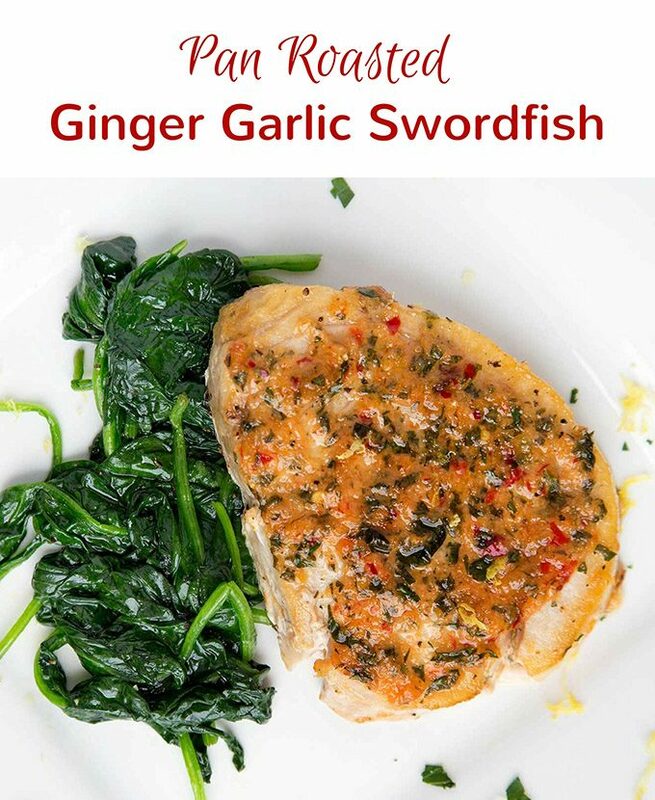 You'll love my easy Ginger Garlic Pan Roasted Swordfish. 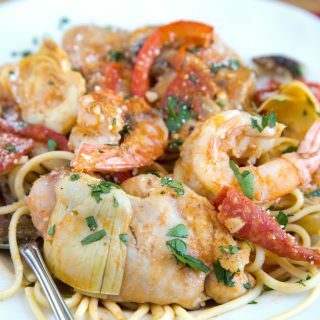 It's the perfect restaurant style meal for your next date night dinner! I always have friends ask me, what’s the best way to cook fish? While my favorite way is the simplicity of Olive Oil, Sea Salt and Pepper, there are times that I add additional flavors to spice things up a bit! After all Variety is the Spice of Life. One of my latest requests was what to do with swordfish? 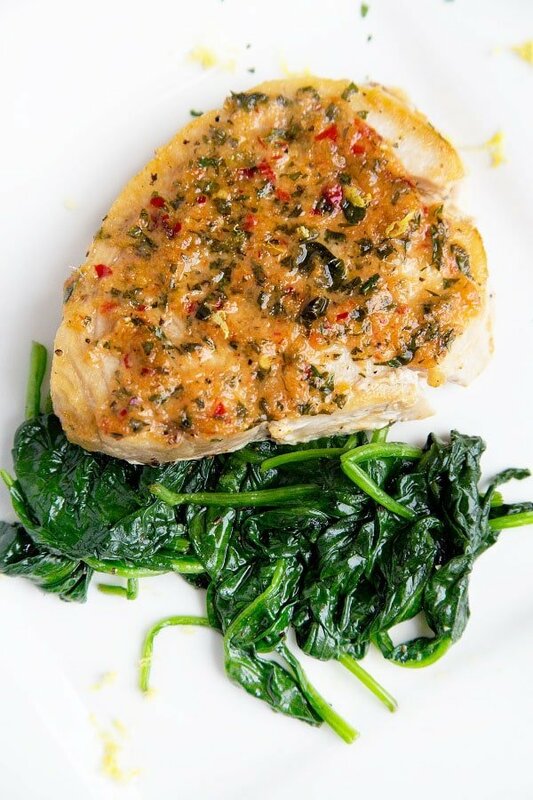 Swordfish can be a disaster if overcooked and is really a fairly bland fish (if its fresh), so you can have fun adding in very flavorful ingredients. Marinating is always an option, but quite frankly I forget to do it, so I always end up looking for other ways to add in additional flavors. Using compound butters that are full of flavors is a great way to spice things up, whether you use it on fish, chicken or beef they can add another layer of flavors to your dish. 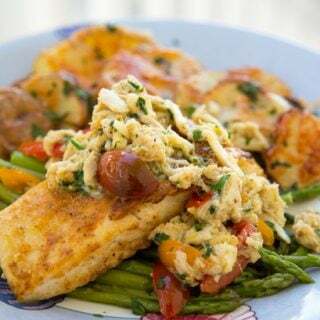 If you’re not a fan of butter, try out some of my other delicious fish recipes like my Red Snapper en Papillote or my Mediterranean Style Salmon. Both are loaded with flavor and butter free. This is my variation of a compound butter that would work wonderfully for you, and don’t be afraid to crank up the flavors you like most by adding a bit more into your butter. That’s how I came up with my ginger garlic pan-roasted swordfish. You can do this fish in the oven for the entire cooking process, but I do like the Pan Roasting Method for some foods, and it worked well with the swordfish. Just make sure you have a good ventilation system! 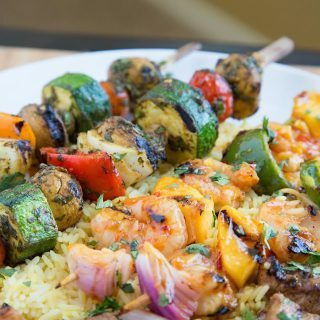 Don’t forget to add a little color to your plates with your favorite side dishes. Wow, delicious and fast, perfect for a weeknight —- but it was so tasty, I would serve it for company. The cook times were spot on; definitely saving this recipe. Thanks!! I’m happy to hear you enjoyed the recipe Sam. I hope you find more of recipes to try in your kitchen. This was the most delicious swordfish I’ve ever made and my first posting about any recipe. Thank you!! I can’t wait to checkout your other recipes! Thank you so much for the comment and great review Julie. I’m hope you find more recipes to try! I wasn’t sure what you meant by red pepper “did you mean capsicum”? So I decided to actually use mild fresh chilli and it was a great choice. A great new swordfish recipe. crushed red pepper is a dry spice, but anything you like works too. Making a recipe your own by changing up ingredients is a great way to stay happy in the kitchen! This recipe looks terrific, I am planning to make it for Christmas dinner. I am thinking to add small pieces of roasted red bell pepper to the compound butter. Do you think this is a good idea? Also, Is it possible to half cook the swordfish and finish the oven part a few hours later? That would be a nice addition. As for precooking yes you can do that but fish cooks so quickly I don’t think I would advise it, you’ll end up overcooking it. The only thing I might do is mark the swordfish on a grill and then finish it in the oven. I wanted to make something special for my husband’s birthday (61) and and bought a beautiful swordfish steak, looked up recipes at home and yours appealed to me. I had all fresh ingredients and the prep was simple. We loved it! Definitely a keeper recipe. We may have to make it when the four kids come home for the holidays! Thank you for sharing this recipe! Thanks so much for taking the time to let me know that you enjoyed my recipe Karen. I hope you find more recipes on my site to try! Delicious, flavorful quick dinner. Even my 16 year old said, “Wow, this is great!” Thank you, Chef Dennis. You are very welcome! Thank you for the comment and great review! First of all I want you to know I hate fish. I was raised eating catfish we caught every weekend, fried and I grew to hate fish. As I got older I tolerated shrimp and lobster. My college age son loves all fish so I force myself to make it for him, though I never eat it. I changed my mind with this recipe. I dug out my cast iron skillet on put it on my glass top cooktop (gasp) and decided to go for it. I went to my local “Lucky’s” supermarket and picked out a 1 pound 2 inch thick swordfish, a lemon and fresh ginger. The rest I had, fresh parsley growing for the swallowtail butterflies. I will admit, I didn’t measure anything, I just wing it, but I’m sure the clove of garlic was the size of 3. After browning it in the cast iron skillet and baking it I threw it back on the cooktop and added the array of spices with the butter and it all came together. I spooned the buttered spices over and over the top and flipped the steak over and over to absorb the spices in a matter of a couple of minutes. It was perfect! I plated it and decided to be brave and take a bite. Well, I loved it! BTW this is the first time in my life I have ever commented on a recipe. Wow Cynda! You have just made my Day with that testimonial! Thank you so much for taking the time to leave a comment and for trying my recipe! Did you bake it in the cast iron as well? My new favorite swordfish recipe! I did use fresh ginger and also…because I like a little kick, added some canceaux sauce! Also, hate to waste lemon, so I squeezed that in also! Cooking time was spot on! Flavors were awesome together! My husband also rated this as an awesome new recipe! Thank you so much! Going to be following your sites. Thank you. I’m very happy to hear you enjoyed my recipe Cameron, Thanks so much for the great review and comment! I did substitute the fresh grated ginger for ground ginger powder however, the flavor was still on point! I have added this to my cook book and will definitely be making it again! I’m happy to hear you enjoyed the recipe Amber, and fresh ginger is the best! Made this beautiful recipe tonight. It was absolutely delicious! I was not a fan of swordfish – my first restaurant experience of it being a very dry and densely textured fish many years ago. My partner liked the look of it in our local fish market so we bought some and I went hunting for a recipe. I thought roasting the fish in the oven would be the way to go, so this recipe seemed to be the best of all I’d read on google. And I wasn’t disappointed. And I loved the compound butter recipe which I believe would go well with other types of fish. Many thanks for posting this superb re ipe. Thank you so very much for taking the time to leave such a nice comment! I’m very happy to hear that you enjoyed my recipe and you’re right that compound butter would work on most fish as well as chicken! Thank you for letting me know you enjoyed my recipe Lauren! 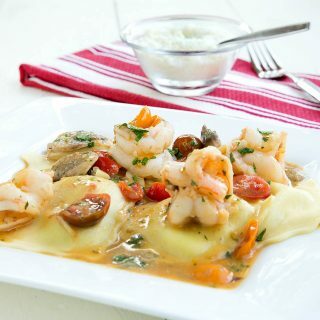 I have a lot of great seafood recipes, I hope you get to try more. how long to bake a 2 inch 10.5 ounce steak? I’m not sure I would cook a two-inch thick Swordfish Steak I would split it into 2 one inch thick pieces. This recipe was absolutely delicious! Thank you! You are very welcome, I’m happy to hear you enjoyed the recipe! I would oven roast it at 350 degrees for about 17 minutes. Depending on your oven it could be less or more, but try to keep it from overcooking. Mmmm, so tasty! I just made this for my first wver swordfish! I’m happy to hear you enjoyed the recipe Kandi! Thanks so much for letting me know you tried and enjoyed my recipe! I hope you find more delicious recipes to try on my blog! OMG this recipe is outrageous. I made it tonight, following it to the letter and it was perfect and delicious. This will be my go to sauce for fish and it’s a great technique for cooking the swordfish. Perfect, moist, great flavor. Thank you! Thank you so much for taking the time to try my recipe and for leaving such a great comment. You made my day! 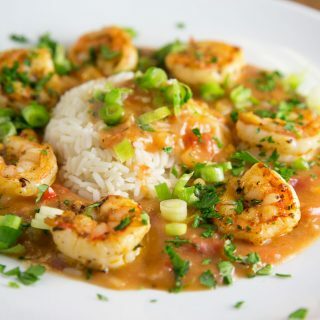 Love to try Scallops (large) with this sauce and technique. Scallops don’t have the same density as swordfish Andrew, just make sure to watch your cooking time, it’s going to be considerably less. Just tried this recipe as written except substituted dried parsley and powdered ginger for the fresh. We loved it! This is a keeper. Thank you! 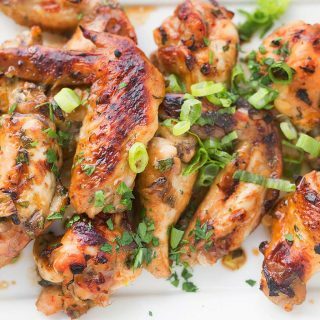 What marinade would you use for this recipe? I don’t use a marinade with this recipe. It would be a bit of an overkill with the topping. I used this recipe to cook swordfish for the first time and it was fabulous!!!!!! Swordfish is now on my list of items to bring home. thanks for letting me know you enjoyed my recipe Jerry! I have lots of other great seafood recipes for you to try next! Saw fresh steaks at the market today and searched for a recipe. This was a great find! Turned out moist and tons of flavor (went heavy on garlic, red pepper, and lemon…sorry). This is a winner I will make again. Thanks so much for the taking the time to leave a comment, and I always say recipes are guidelines. Its okay to adjust things to liking. 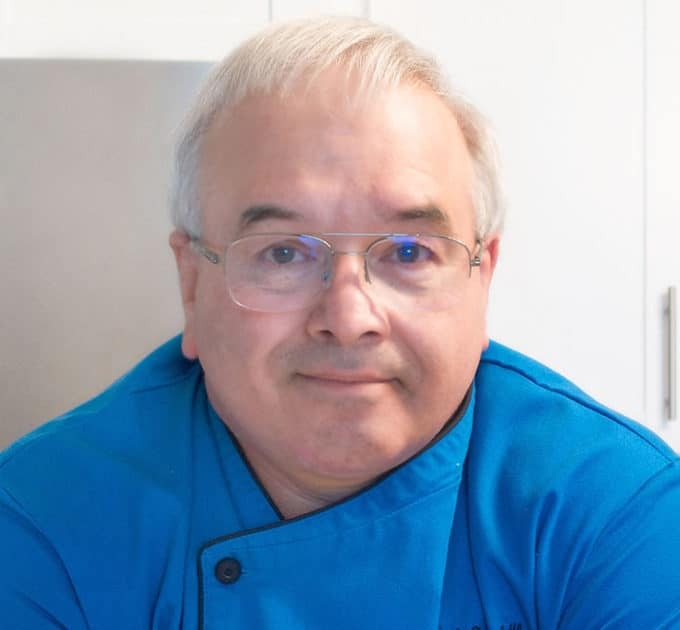 I hope you find more of my recipes to try, I do have a lot of fish recipes. Thank you and I’m happy to hear you enjoyed the dish! Love the recipe! Will try it tonight. Following weight Watchers so the nutritional count is important in calculating daily points. Questioning the protein count of 1. Is your nutritional value just for the butter sauce? I’m sorry about that, the program I use for nutritional values is not very forgiving and didn’t read the swordfish properly. Using 6 0unce fillets its coming up as 33 g of protein now. I made this last night and it was DELICIOUS! I upped the garlic an extra clove. I took some for lunch today and it was even better today after marinating in that sauce all night. I will definitely be making this again. I’ll put it in my “guaranteed win” category! extra garlic sounds good to me, and I’m very happy to hear you enjoyed the recipe! Just made this tonight; it was literally perfect! I was told it “hit the spot.” Definitely making this again. Thank you!!! I’m very happy to hear you enjoyed it Nailah! Thank you!! I made this for the first time tonight. It’s crazy good!!! And easy enough for a busy weeknight but special enough for company or someone you want to impress. Thanks Tracy, I’m happy to hear you enjoyed the recipe! Wow! I made this tonight and it was so delicious! So rich and flavorful! It was also pretty quick and easy to make, very straightforward. Thanks for a great recipe I’m sure I’ll use again! I’m happy to hear you enjoyed the recipe! I hope you can find more on my blog to try. Great Recipe Chef. The whole family loved it. Thank you Andrew, I’m very happy to hear the recipe was a success! Absolutely delicious! I used pumpkin swordfish. thanks for the feedback Carolann, I’m glad you enjoyed it. I’ve never seen pumpkin swordfish, I’ll have to keep an eye out for it. This is a fantastic recipe. I changed things up only a touch. I look this out to the grill and seared it on both sides and then finished cooking it in a cast iron skillet (still on the grill). The first time I made this is was amazing but it needed a touch of sweetness so the second time around I added just s little bit of diced mango and it was just what was needed. This is a ish I’ll be sure to pull out in the future! Thanks for your feedback and I’m very happy to hear you’ve been enjoying the swordfish recipe! This looks great, Chef Dennis! I love to grill swordfish with a simple ginger soy marinade, but this looks like a good option to vary my routine. Thanks David, It was a very tasty way to prepare the swordfish! Wow, amazing looking fish Chef, the flavors look so tempting. I think this seasoning would go very well with cod too…too good. thank you and they would indeed be a very nice way to serve cod or just about any fish! Your compound butter sounds fabulous, Dennis! Perfect for your swordfish, but I can see using it with salmon, too. it would work really well with salmon too Kath, and you can customize the ingredients to the flavors you enjoy! 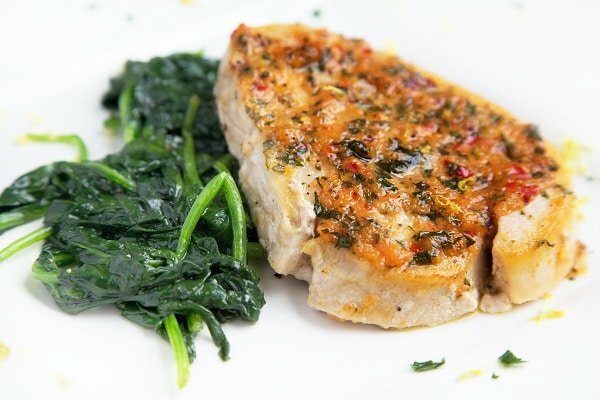 I love all fish but have not cooked swordfish and will now remedy that with you tasty recipe. I know what you mean about ventilation system – I have set off my smoke alarm so many times,lol. Thanks for a great dish, Chef Dennis! Glad you like it Robyn, I hope you get a chance to try the recipe soon! This looks delicious. I always like swordfish; i think because it’s a sturdier fish. And you had me at the chili flakes! it was very tasty Luci, thanks so much for stopping by! This looks amazing Dennis, I love how you flavored the swordfish! Thanks Matt, the topping really added a lot of great flavor! Good to hear from you over here Dennis. The fish looks delicious. Thank you Larry, and thanks so much for stopping by! Thanks Claudia, and its Credo in College Park. thank you! I’m happy to hear that you enjoyed the recipe!